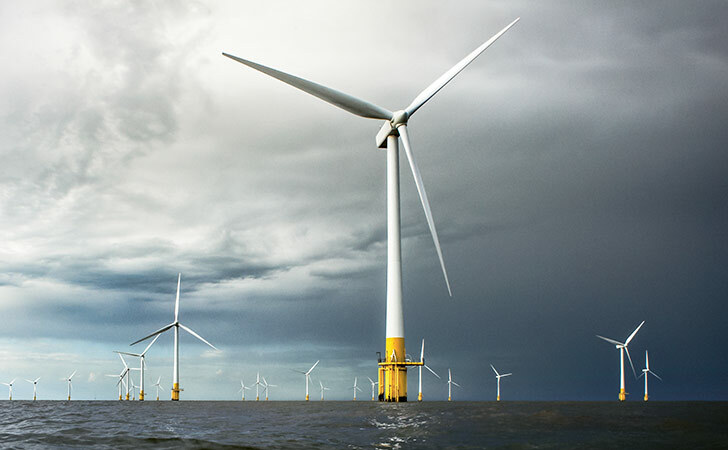 Swiss Re Corporate Solutions takes a special interest in offshore wind as it has both the large capacity and the technical expertise to help manage the associated risks. We are continually enhancing our understanding of these risks and share our insights with our clients as well as other insurers. As a result, we are now considered a “lead market” for offshore wind risks. In the last five years, Swiss Re Corporate Solutions has participated in 35 offshore wind projects, including wind farms, standalone offshore substations and standalone export cables. In 2016, we were involved in nine offshore wind farm projects worldwide and were the lead insurer in five of them. Offshore wind farms come with complex risks. Swiss Re Corporate Solutions has the financial capacity and the technical know-how to offer effective insurance for such risks. In 2016, Swiss Re Corporate Solutions signed two new offshore wind farm projects as co-lead insurer. One of them is Rentel (www.rentel.be) in the Belgian North Sea, situated approximately 34 km from Zeebrugge and 40 km from Ostend. It is being developed by a consortium of eight Belgian shareholders with a strong track record in offshore wind, who joined forces in a strategic competence centre. The insurance cover offers Rentel compensation for material damage and loss of profit, both in the construction phase and the first three years of the farm’s operational phase. Rentel will comprise 42 wind turbines of 7.35 megawatts each, in total producing 309 megawatts at peak. The turbines are connected to an offshore transformer station, from which the power will be transmitted to an onshore substation at Zeebrugge and fed into the grid. The electricity generated by the wind farm will supply approximately 285 000 households with climate-friendly energy. Construction started in early 2017 and is expected to be completed by the end of 2018. The second new facility we underwrote in 2016 is Merkur Offshore Wind Park in the German sector of the North Sea, 45 km off the island of Borkum. It is a joint venture between Windreich and Belgium-based DEME. Merkur, too, is insured against material damage and loss of profit in its construction phase and the first three years of its operational phase. Beyond this, the insurance cover also protects the manufacturers of the wind turbines and foundations. Merkur will consist of 66 wind turbines of 6 megawatts each, resulting in a total installed capacity of 396 megawatts. As the wind park is located a considerable distance away from the German mainland, the power it generates will be transmitted to a converter station currently being built (DolWin gamma) and converted to direct current. This technology makes it possible to minimise transmission losses over the 80 km long sea cable. By facilitating the construction of offshore wind farms, these solutions support efforts to reduce CO2 emissions and hence mitigate climate change. In 2016, Swiss Re Corporate Solutions won the second consecutive award from Environmental Finance magazine for a particularly innovative transaction in the “weather risk management” category. The award recognised a wind risk hedge we developed for Infigen Energy, the largest owner of wind energy capacity in Australia. This hedge is the first of its kind because it looks at actual energy production across multiple sites. In contrast, traditional wind protection solutions are tied to single sites and are based on modelled wind speed indexes. In practice, the new product pays Infigen Energy a fixed amount for each megawatt hour of energy production lost due to low wind, below a specified trigger across its entire 557 megawatt Australian portfolio of six wind farms. This helps our client to raise cash flow predictability and to reduce earnings volatility. As renewable energy investment continues to grow, we expect demand for effective risk management solutions such as this to increase substantially over the next few years. We already won this award in 2015 for a solar hedge for photovoltaic power plants in China, underlining our ability to respond to this demand.